One of my all-time favourite sauces is pesto. The combination of fresh herbs, garlic, pine nuts, beautiful olive oil and delicious cheeses are just perfect in my mind, although my gut tells me differently. I could quite easily eat a jar of pesto all by myself but there are unpleasant consequences that come with doing such things. I do have the cheesy version in all it’s glory on the most special of occasions, such as the times I have travelled to the birthplace of pesto, Liguria in Italy as I find it impossible to resist. I usually make my travel companion order the pesto dish though, so I can try it and not be tempted to finish it! 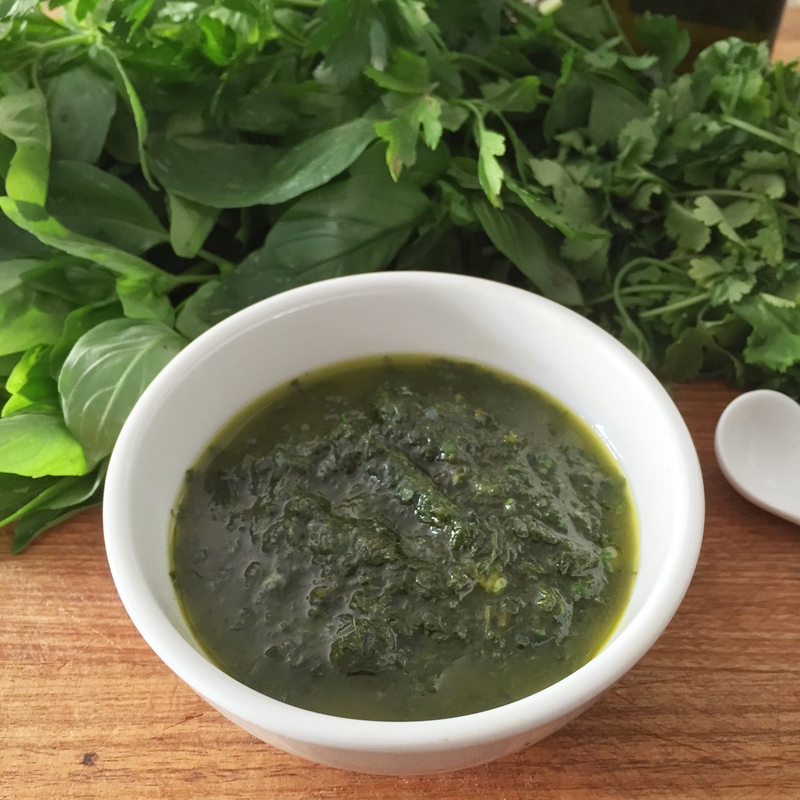 My mixed herb salsa recipe is a little ode to pesto with all the irritants removed. It contains no cheese and garlic is optional so you really are relying on the inclusion of extremely fresh herbs and an excellent olive oil. I use all organic herbs and my preference for oil is Alto Organic from Alto Olives, which can be found in a number of stores across Australia. Once made it will keep for up to a couple of weeks in the fridge but I rarely get a week out of it before it’s all gone! Add salt and pepper to taste (I used about 1/2-ish tsp of salt and about 1/4 tsp of ground pepper. This will be a very personal thing, especially if not using garlic and lemon, which I don’t so taste as you go and keep adding salt and/or pepper until you’re happy with the flavour). Blend to combine and serve with your favourite savoury dish. I like it with my zucchini fritters! Note: To keep this recipe low histamine, garlic and lemon should be avoided.